LARENCORE: U.S : MICROSOFT must cancel their $19.4 million contract with ICE now. U.S : MICROSOFT must cancel their $19.4 million contract with ICE now. Microsoft is complicit in Trump's mass incarceration and deportation of Black and Brown people. Tell Microsoft they need to #CancelTheContract. Trump’s executive order amending the ‘zero tolerance’ practice that separated families at the border was forced by hands of the millions of outraged people across the country, but it doesn’t go far enough to end the criminalization of immigrants.1 Trump's order means that families will be detained together going forward, but there’s no plan to reunite children currently detained in isolation.2 This is unacceptable, state-sanctioned violence. There shouldn’t be any kids in cages, at any time or in any place. Not in tent cities at our borders, not in abandoned Walmarts, and not in juvenile detention centers. We have to dismantle the structures of mass deportation, not institutionalize them. Black folks know that the answer to family separation is not family detention. We know that the southern border is a point of entry for many of our folks from the Caribbean.3 We have to consider the impact this will have on Black immigrant families, who are affected by both immigration enforcement policies and the criminal legal system which mutually inform each other and are deeply embedded within each other. As outrage over ‘zero tolerance’ has built over the last week, the role of corporations in enabling the deportation machine has been revealed. It was exposed that Microsoft is actively profiting from a $19.4 million contract with Immigration and Customs Enforcement (ICE). 4 Trump is really clear about his agenda to entrench the racist systems of incarceration and deportation, we have to be really clear about our intentions to dismantle that same system. Tell Microsoft to stop enabling Trump’s deportation machine and cancel their contract with ICE. Microsoft CEO Satya Nadella recently claimed the company “will always stand for immigration policies that preserve every person’s dignity and human rights.” 5 So, it’s unclear why he won’t cancel a contract with an agency that routinely violates constitutional and human rights.6 If we can build enough public pressure to remind Microsoft that their clients and contracts should reflect their ideals, then we can get them to drop their contract with ICE and dismantle the technological structure ICE needs to fuel their deportation machine. Tell Microsoft to embody their stated support of human rights by withdrawing their technical support of ICE. Companies can recognize the power of consumer demands. 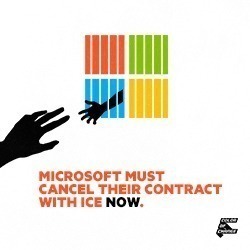 Let’s demand Microsoft drop ICE and stop turning a profit at the expense of Black and Brown families.